Raymarine ST40 Bidata Display gives in one display the data provided by ST40 Depth and ST40 Speed units seperatly additional to Temperature data. It is for use in Seatalk or ST40 systems as a repeater or installed as a master display combined with a suitable Bidata Transducer. 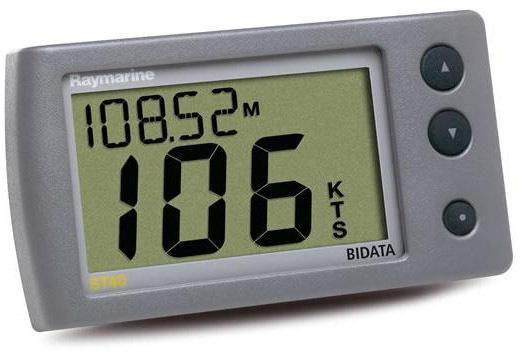 The ST40 Bidata Display is SeaTalk compatible and integrates with Raymarine autopilots, Raymarine Chartplotters (multifunction displays) and other navigation equipment. It could be installed as a master display combined with Transom mount or ThruHull transducers (sold seperately)or as a repeater fora chart table or second steering station. The ST40 Bidata Display has big high contrast LCD display with two 7 segment digits 28mm and 17mm for displaying speed and depth data simultaniusly with excellent visibilityin all lighting conditions and 3 levels of display-backlighting for night use. Minimum depth is recorded during the period the Raymarine ST40 Bidata Display is switched on and can be reset at any time. Alarms can be defined for shallow water, deep water, shallow anchor and deep anchor. A keel or waterline offsets could be set according to your boat's characteristics and be displayed at any time. ST40 Bidata Dispaly can display current speed, Maximum and Average speed. Log and trip information is presented in nautical miles (NM), statute miles (M) or kilometers (KM). Depth display units are either feet (FT), meters (M) or fathoms (FA). Speed display units are eitheknots (KTS), miles per hour, (MPH) or kilometers per hour (KPH). Water temperature is displayed in Celsius or Fahrenheit degrees. You could choose your mounting hardware's color (bezels for surface and bracket) between 3 finishes (Carbon fiber, Silver, Grey). ST40 Bidata Display includes sun cover, mounting hardware, SeaTalk cable and instructions. Speed readout in knots, kilometers per hour or miles per hour. Supply voltage: 10 V to 16 V dc. Current consumption (12 V supply): 35 mA typical, 70 mA with maximum backlighting. Operating temperature: 0°C to +70°C. Overall dimensions: 126 mm x 70 mm x 38 mm (5.00 inches x 2.80 inches x 1.55 inches). Boss diameter: 55 mm (2.20 inches). Speed range: 0 to 99.9 knots. Log range: 0 to 99999. Trip reading range: 0 to 999 nautical miles. Temperature reading range: -10°C to +40°C. Depth range: 0 to 400 feet. Shallow depth alarm: 0 to 29 feet. Deep depth alarm: 30 to 400 feet. Shallow anchor alarm: 1 to 250 feet. Deep anchor alarm: 10 to 400 feet. Click the button below to add the Raymarine ST40 Bidata Display Depth & Speed E22039 to your wish list.